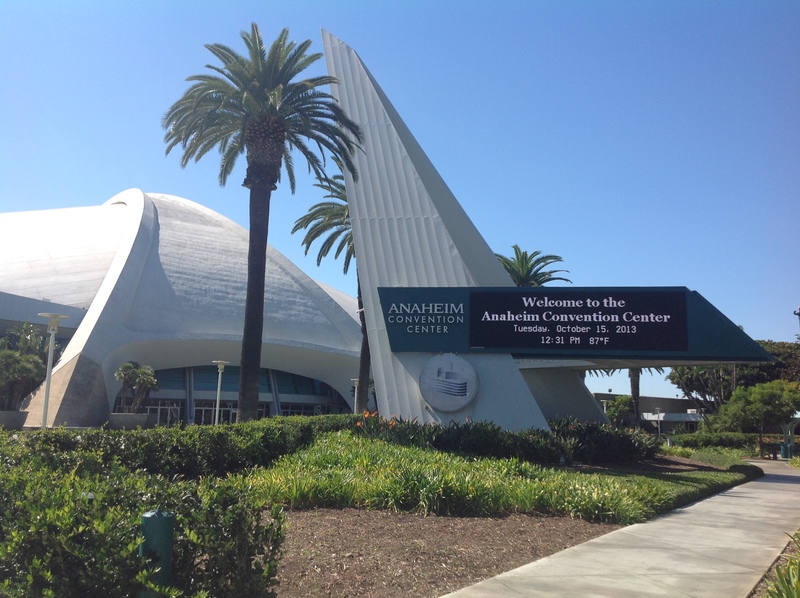 I’ve spent the last few days here in Anaheim (a stone’s throw from Disneyland) at the annual Educause conference. It’s my first time here and I’ve found a few things that were surprising or of note. The first thing to say is that this is a very well organised and VERY big conference. I’m pretty sure it’s the biggest I’ve ever been to with some 5500 people in one room for the keynotes. Given the number of people hammering the wifi simultaneously they have done really well to keep the service going and everything seems to be running like clockwork. There really is a lot going on here – the programme looks like a telephone directory. That said, it was a bit disappointing to find that with so much going on not all of the sessions are recorded for posterity. In particular, I think the keynotes should be available although Ken Robinson‘s will not be. His session was all about the need for imagination and creativity, though for me the link through to formal education was a bit sketchy. Jane McGonigal‘s enthusiasm for videogames really came through during her keynote about gamification which was very well received. She did a great job of explaining the rationale behind gamification to an audience who it seemed were not natural gamers, but I confess to being left with quite a few questions at the end about both the psychology informing her position and the vision of the future of education that was being proffered. I haven’t been able to attend everything I wanted to. Partly this is due to the sheer volume of talks but also because I took a little trip out to University of California Irvine to meet with Larry Cooperman (which I will write about separately). My overriding impression of the conference, though, is how little mention there is of open education or OER here. I asked a few people about this and was told that there had been an OER focus in previous conferences. But I know that there’s quite a lot going on out there and so it feels like a conspicuous absence. I have managed to track down all of the people involved in OER related presentations and had some interesting chats. I managed to catch up with Amy yesterday and we had an interesting chat about some of the work she is involved with over at Empire State College, State University of New York. She has been working with others to develop a Global Learning Qualifications Framework to evaluate learning across a variety of learners and courses. An open curriculum system allows students to create their own programme of learning and this seems to lead to positive results in terms of performance and retention. They have a lot of students who started out using Saylor materials so linking up their data with our own survey data could prove very interesting in respect of our hypothesis about the transition from formal to informal learning being supported by OER. I was first drawn to speaking with Josh by the headline figure of a 7% uplift in student grades as a result of interventions which took place on the basis of automated analysis of performance. They had a big sample group – around 2,000 students – but the overall picture is still a bit unclear. There were two groups who got support and a control group. The two groups that received support either received this in the form of automated messages or through an online support forum. There wasn’t a significant difference in the subsequent performance of these groups so it might be that interventions are what is important regardless of what form they take. In any case, the results are encouraging from an OER point of view since they seem to be getting results that commercial alternatives would be happy with and the peer-to-peer mentoring is something that they will be focusing on in the future. All the materials are available on a CC-BY licence. You can find out more about the project at https://confluence.sakaiproject.org/pages/viewpage.action?pageId=75671025. This presentation started with an outline of the prohibitive cost of many educational materials, particularly textbooks. (The suggestion was made that students tend not to be interested in OER but they are interested in digital texts they can annotate.) The solution suggested emphasised the need for institutional readiness to adopt which runs across faculty and IT staff. Responsibility for student support needs to be clearly delineated, especially during the piloting phases, recognising all stakeholders. GingkoTree allows for the curation of a range of digital content which can act as anchor for pedagogical activities and discussion. For their pilot activities they chose faculty on the basis of applications which suggested they could make effective use of the technology and evaluate it successfully. (There was a lot of take-up from arts & humanities and none from social science.) Many faculty were interested in using both OER and copyrighted materials beyond ‘fair use’ – GingkoTree automatically ensures that relevant payments were made to copyright holders – rather than being locked into an OER approach. (By entering ISBN number, etc and identifying the specific sections you want to use the system automatically calculates the revenue and payments required.) The tools provided within the system look pretty useful from the point of view of supported blended learning and guiding students. They include archives of learning materials, annotations, discussions, voting and quizzes but don’t yet allow for grading & feedback, or much in the way of multimedia content. Overall, I got the feeling that this was really an OER-agnostic platform which would lend itself quite well to a teacher who was thinking about integrating OER into their teaching without necessarily moving to a fully open approach. It would also encourage students to interact with each other. I get the distinct feeling that perhaps institutions and students have to pay for the service. I made the point that the danger here may be in settling for a partly open solution when a fully open approach might be preferable. Tanya made the salient point that at least the whole thing hasn’t been bought out by one of the big educational publishers. (It’s a comfort of a sort but not the same thing as an ongoing commitment to openness.) They’re quite early on in their pilot, so it may be worth checking in with them at a later date to assess the impact of what they’re doing. Late on Thursday (17th October) I took part on the Openness Constituent Group panel on the theme of openness in education with Kim Thanos of Lumen Learning, Patrick Masson of UMassOnline, Doug Johnson of University of Florida, Paul Erickson of University of Nebraska Lincoln and Ken Udas of University of Southern Queensland. The conversation was inclusive and wide-ranging and it seemed like everyone got something out of it. I’ll post a link to the recording when it becomes available but you can follow the live tweets on Patrick’s Twitter account. I took two main points from the discussion. Firstly, there is a need for clusters of OER activity and OER advocacy to translate into more diverse communities and thus bring about institutional change. Secondly, the rationale behind OER Research Hub – and particularly the forthcoming Evidence Hub – was justified as a catalyst for making this happen. On the non OER-related front there was too much going on to summarise, but given the roles most of the delegates perform there was understandably a focus on practical initiatives for campus and distance learning technologies. There seems to be a buzz around learning analytics and what I would probably term as xMOOC extensions of existing courses. The exhibition space here has to be seen to be believed; I don’t seem to have been able to take a picture that does it justice. It is huge and filled with custom built displays. Needless to say there are some very big corporations spending a lot of money here. Might this explain the lack of conversation about open education? Out of hundreds of presentations, these were the only ones with any mention of OER that I could identify. Anyway, this could (optimistically) all be seen as evidence of considerable opportunity to talk about OER. Finally, it was a pleasure to connect with George Veletsianos today after lots of online interaction over the last year or so. It was good to hear that he has a prestigious new position up in Victoria and continues to be interested in understanding openness in education. I also got to chat briefly with Dr Chuck! Dr. Robert Farrow, Create a free website or blog at WordPress.com.